Linyanti to Kasane Botswana - Road conditions. Leaving Linyanti for our next stop, the Chobe Riverfront area, it is advisable to make use of the cutline that borders the park. Follow the river in a north-easterly direction, past the Savuti turnoff, for about 5km - turn right into the cutline and follow this for approximately 40 km where you will join the main Savuti - Kavimba road. By making use of this cutline, you not only cut down on distance, but the condition of the road is far better. Leaving the Reserve temporally, we travel through the Chobe Forest Reserve. 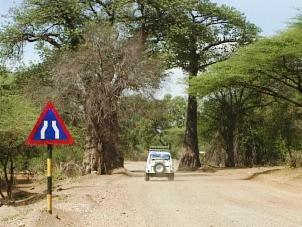 This 40 km stretch of road can be extremely sandy and a 4 x 4 is essential. After good rains, most part of this narrow road fills up with water that gives the impression that you are driving through a river. Because good or bad is relative, it is difficult to classify the condition of the roads in the wild. Once again it must be stressed that with a positive attitude, common sense, a spirit of adventure and a sound equipped vehicle, you could tackle any road in Botswana. The golden rule - always be prepared, and don't panic. 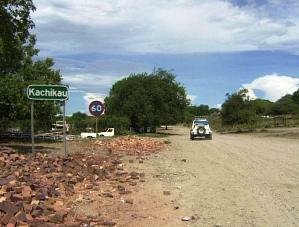 As we enter Katchekau - where reasonably well stocked shops and liquor stores can be found - but no fuel - a good gravel road which could become badly corrugated, awaits us. This is a good time to stop and unwind with a cold drink. Reaching this village you have come to the end of a chapter on your wilderness adventure. 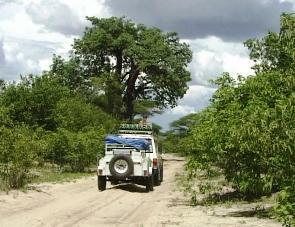 You have managed to concur the sometimes inaccessible roads of Moremi and Savuti. You have reached civilization, and very good road conditions awaits you now. Face the corrugation for another 40 km and you will be on tar.